When it comes to crafty equipment, I love my sewing machine, my crafty cutter and my paint brush. But I have to say, two of my most versatile tools in my tool box are my glue gun and a can of spray paint. Today, I wanted to share a project that uses both of those. If you have never been to my blog, you should know that I love painting objects white. I think that white paint can unify decor and make old items look more modern. Most recently, I painted the inside of my apothecary jars white to simulate the look of milkglass. You can read more about my addiction ode to white paint in this post.. 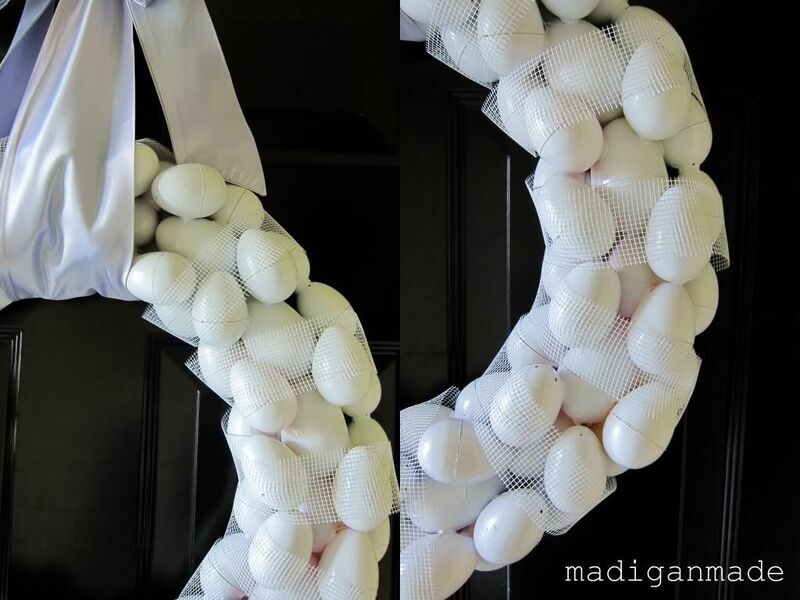 This egg wreath needed a little something more, so I added "ribbon". Yes, if you look closely, that is NOT white ribbon wrapped around the wreath. It is dry wall tape instead! 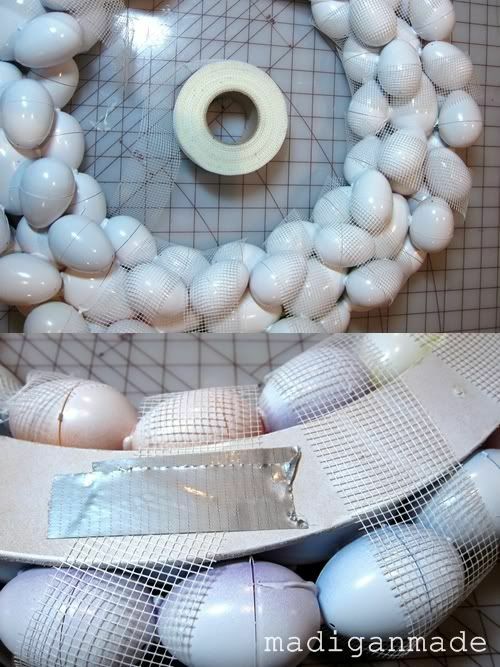 Sometimes a girl’s gotta get creative with materials! 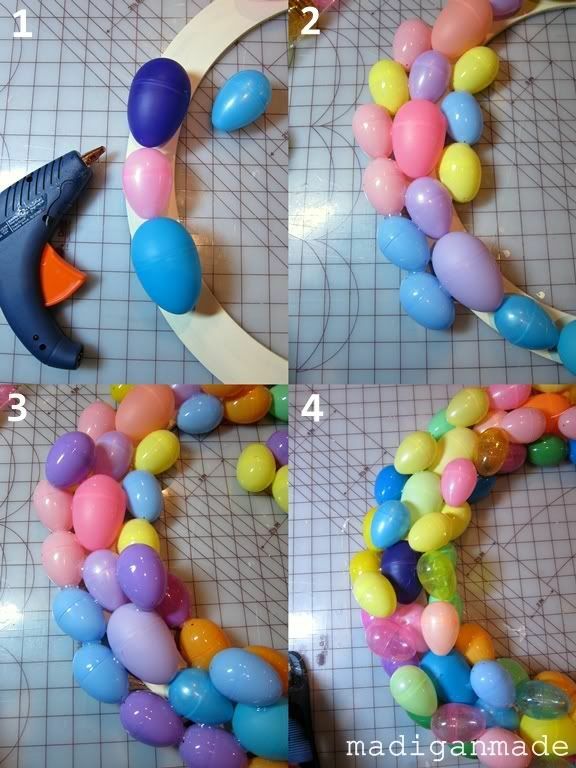 Supplies used: 18" wooden wreath form White craft paint 100+ plastic Easter eggs, various sizes White spray paint (for plastic) Glue & glue gun Dry wall tape Duct tape Wide ribbon or scarf Step 1: I started by painting the wreath form with cream white craft paint. I needed a spray paint specifically made for plastic (regular spray paint will peel right off plastic). I used some of Krylon’s Fusion paint in white gloss. 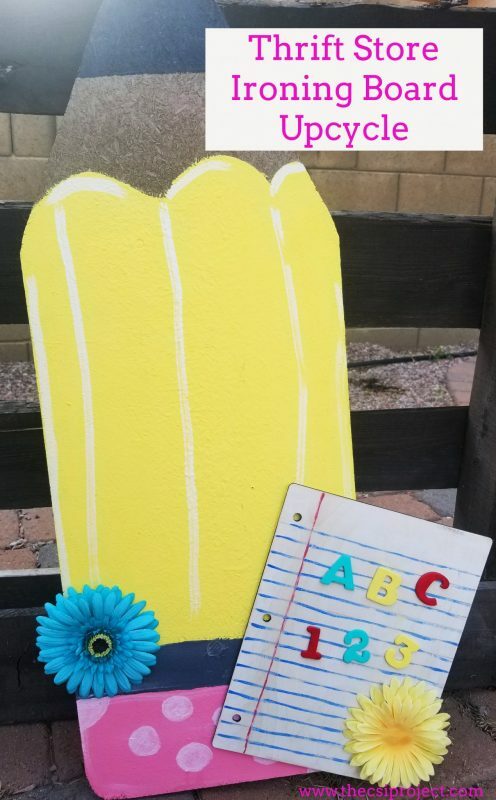 To spray paint it, I started by painting the back of the wreath first with several light coats. After an hour, I flipped it over and sprayed the front of the wreath with multiple thin coats. Tip: Keep the can moving and try to paint from several different angles as you move back and forth. 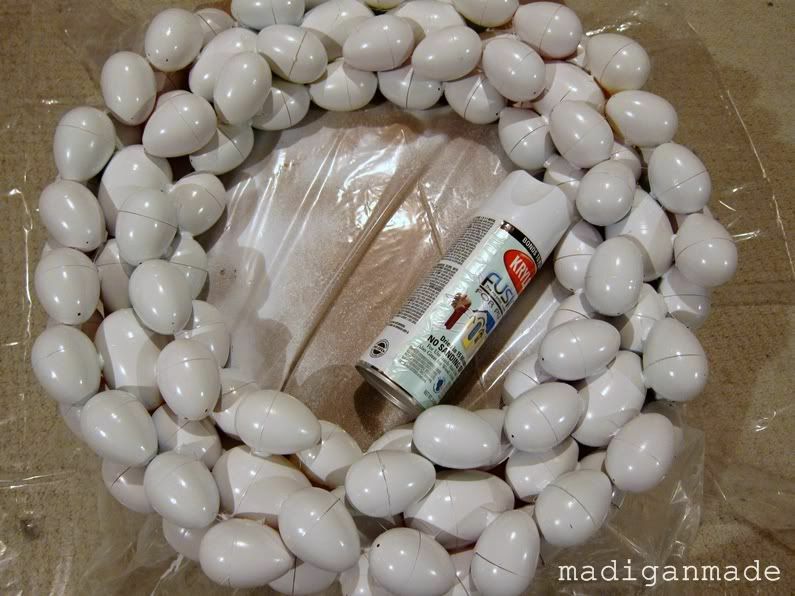 This will ensure that the paint ‘gets in between’ the eggs and covers everything. Then I wrapped the dry wall tape around the wreath just like I would ribbon. The light adhesive on the back of the tape ensured that it did not slide around or move on me, which was nice. I secured the ends of the tape to the back of the wreath using duct tape. I tried using traditional ribbon around the entire wreath, but it did not look quite right to me. 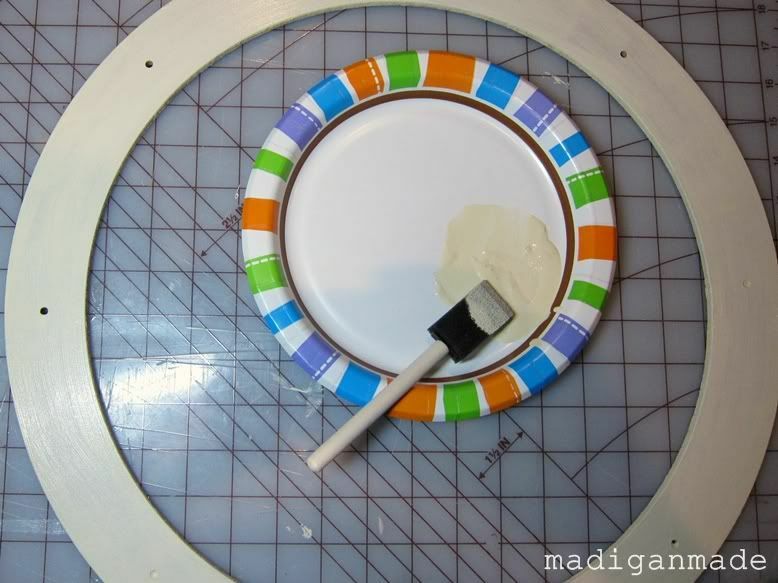 I’m so glad I saw the dry wall tape on our workbench. It was the perfect solution! 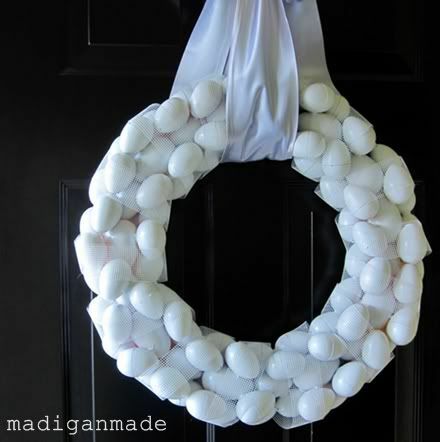 I love how the dry wall tape does not completely obscure the eggs but adds another layer of white texture to the wreath. 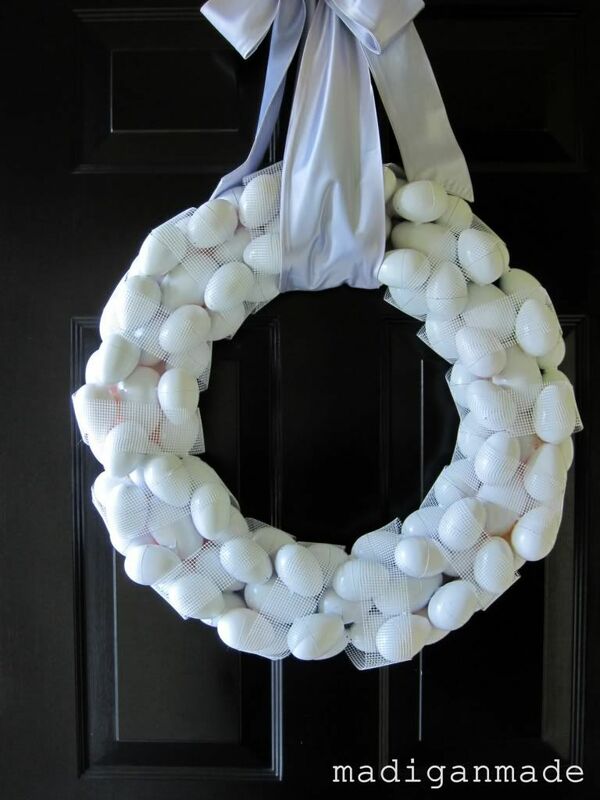 This wreath is a simple and big statement. 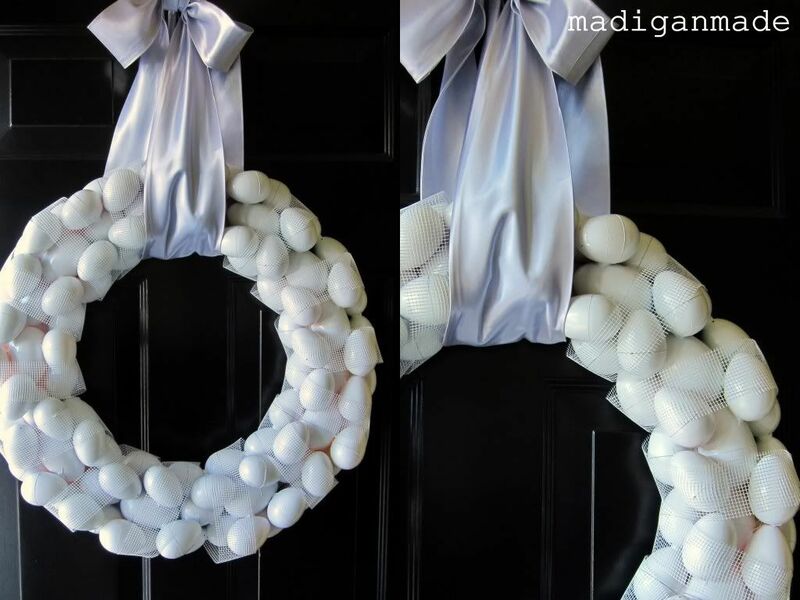 It will be perfect for our front door this Easter. It always amazes me what a little hot glue and spray paint can do! What are your favorite DIY tools? 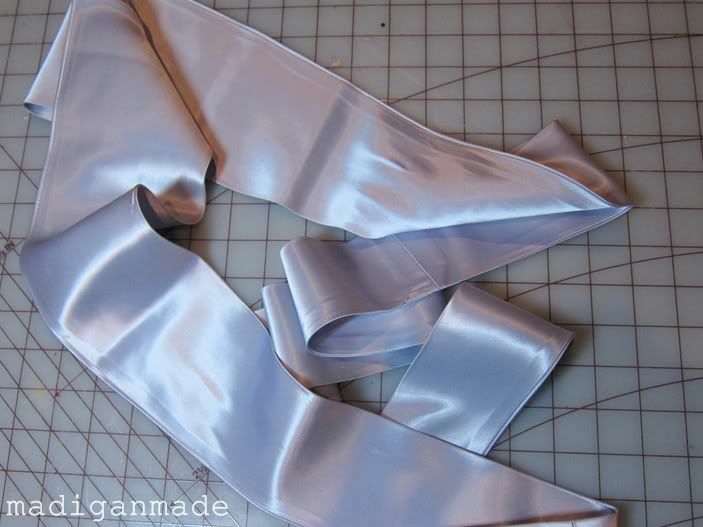 , I encourage you to stop by Madigan Made and say hello! You also are welcome to follow me on Facebook, Twitter or StumbleUpon. I enjoy sharing ‘behind the scenes’ tidbits and great ideas I find on other blogs. Jen, Amanda and Beckie: Thank you SO much for having me here today! You are the best hostesses! 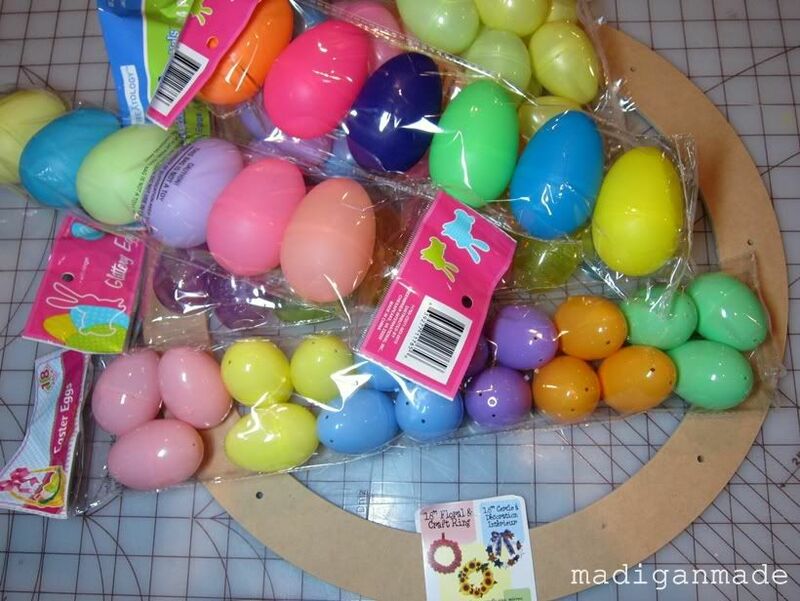 I can’t wait to see everyone else’s Easter projects this week! Wow, that is so cute! Never would have thought to use drywall tape. Oh my gorgeous! Drywall tape?! NEVER would have thought of that! Such a pretty project for spring!